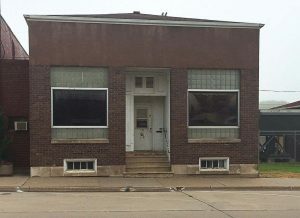 Cities of 5,000 and smaller in Iowa have been given an unique opportunity to address abandoned commercial and public structures through the Iowa Department of Natural Resource’s Derelict Building Grant Program, which was established in 2011. This program offers the financial assistance communities might need to improve the appearance of their streets, revitalize local economies and alleviate the environmental concerns abandoned structures can pose — such as asbestos. Using funding from the DBGP, cities are first able to investigate the amount of asbestos present in a building; determine the physical characters and stabilities of their structures by completing structural engineering assessments; and abate identified asbestos. These projects can then reapply for more funding for the following year for additional program-related tasks like building removal or renovation. Landfill diversion is a major goal of the program, and it is promoted by incentivizing cities and towns to recycle or reuse building materials. DBGP does this by reimbursing 50 percent of demolition and renovation costs based on the percentage cities reuse/recycle with a cap of $50,000. “We’ve reimbursed $1.8 million and diverted 47,000 tons of construction materials, like brick, wood, concrete, etc., and 593 tons of asbestos,” Flagg said. While being environmentally friendly, this diversion has also saved Iowa communities $1.5 million in landfill disposal costs. For Flagg who is not from Iowa, the program has been a unique way to learn the state’s geography and its 99 counties, though he said so far the DNR has only had projects in 60 counties; however, it is a goal to expand to those remaining counties. Iowa DNR is also looking into additional programs to help communities, with Flagg commenting that a program to prevent buildings from becoming derelict in the first place is being considered. Once momentum is built, Flagg said many of the communities are addressing their derelict buildings and choosing to fulfill local needs, whether by renovating or tearing them down to make way for something else. For instance, this past August, 18 communities were awarded grants, totaling $350,000. Their projects included not only asbestos and structural assessments and asbestos abatement, but also major goals and improvements, from a multi-purpose theater to more senior housing and land for development. For the cities of Preston, Tabor and Carlisle, Iowa, which were among those 18 communities, DBGP gave them the push to satisfy their own communities’ needs. Preston had an approximately 700-squarefoot brick building that had been vacant for years in its downtown. City owned and once serving as the former clerk’s office, something had to be done with it. Patti Hoffman, a Preston City Council member and a Preston Growth and Development team member, said both demolition and restoration were considered as options. She, however, completed the grant for restoration first, spurred by findings from an Iowa Economic Development Authority walkabout assessment of Preston’s downtown. Prior to realizing this dream, however, Preston used the phase one grant to make sure the building was not full of asbestos and structurally sound before any money was put into it with a remodel. After it cleared, she pursued further grant funding through DBGP to develop the business incubator and was successful. “Scott Flagg has been phenomenal. He is my hero,” Hoffman said, sharing how he helped her and Preston through the DBGP process and found resources for her small city. “We would not be where we are without his expertise and support. “It’s so exciting,” she added, noting the city has embraced DBGP’s landfill diversion goal by finding items in nooks and crannies to recycle and reuse, including a furnace. As part of the remodel, which kicked off in October, the city of Preston will be working with a lot of skilled volunteers to drywall the building and make it wheelchair accessible while keeping its old vault with its arched ceiling. The goal is to complete the remodel in November with an open house the first weekend before December. 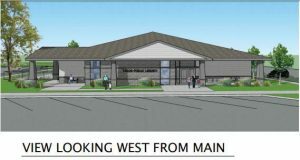 “We have not had formal requests but have had several parties express interest,” Hoffman said of potential businesses. She hopes to have a business in sometime during December. 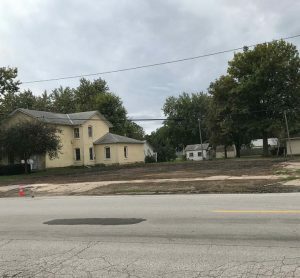 Tabor, Iowa, tore down a derelict brick building to create space for a new library, which has been in the planning stage. The yellow house, visible in the after photo below, is currently where the library is housed; it will be taken down once the new library is built. Tabor, however, faced a challenge because it didn’t own the building that had once been a restaurant. 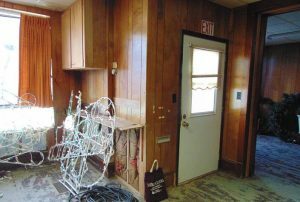 “The owner wasn’t local and didn’t care how it looked, only putting in the bare minimal effort,” she said. The city decided to purchase the building and demolish it to open the way for a new library, something it had been planning. Williams noted it was a long process, but once the purchase was complete, she applied for the additional funding to demo the building and was successful. The building was then demolished in September. “It was the first building people saw coming through on Main Street,” Williams said, noting one business owner had decided not to buy a location in Tabor because of the dilapidated building across the street. Once this got back to the city council, she said they moved very quickly. Faced with limited downtown parking, Carlisle looked to DBGP to aid in funding its demolition of a derelict building in its downtown area. “It was a white cinder brick building next to a grassy area and building that used to be a gasoline station,” City Manager Andrew Lent said, noting the latter two properties had been donated to the local chamber of commerce for its use. The city purchased the cinder block building in November 2016 and had it inspected for asbestos prior to the purchase. In December, the city contracted to have the small amount of asbestos present removed. Lent said after the city leaders became aware of DBGP and its landfill diversion reimbursement, they opted to apply for the grant for the building’s demolition. “We took metal from the building to a local metal recycler,” Lent said. “Concrete was used to reline our sewer lagoons — to help prevent erosion.” He estimated that about 89 percent of materials were diverted from the landfill. Demolition work was completed Aug. 28, and the city has kept the building’s concrete slab to be used as a parking lot area to support a park/greenspace/bike hub area. Carlisle Parks Department has planned several events in the area while chamber is launching a bicycle-friendly community marketing push to businesses, touting the city’s newly constructed 3.2-mile nature trail. By bringing parks and trails downtown, Carlisle hopes to spur economic development by increasing traffic to downtown businesses. “Recently, we have had one restaurant open up and another expand,” Lent said, noting there is still one empty restaurant storefront in the downtown area. With the added parking and addition of a trailhead, it is hoped that opening will be filled quickly. Currently, DBGP still has $50,000 available for asbestos assessment, asbestos abatement and structural engineering assessments. Cities of 5,000 and smaller can also enter the next funding round by submitting their applications by April 4, 2018. For information, contact Scott Flagg at (515) 725-8318 or Scott.Flagg@dnr.iowa.gov.